Micro Machines: The Original Scale Miniatures (called either “Micro Machines” or simply “Micros”) were a line of toys originally made by Galoob (now part of Hasbro) in the mid 1980s and throughout the 1990s. Galoob licensed the idea behind Micro Machines from Clem Heeden, a toy inventor from Wisconsin. 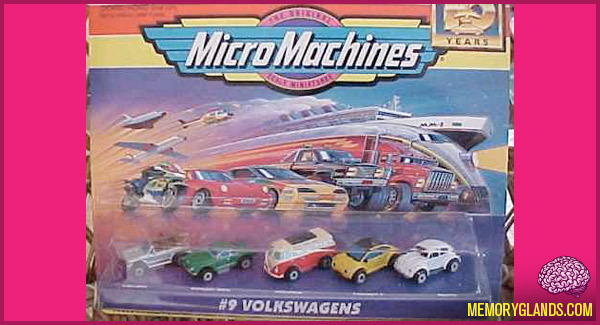 Micro Machines were tiny scale component style “playsets” and vehicles that were slightly larger than N scale. Although Micro Machines have not been sold in the United States in some years, newer models are available in the UK, Europe and the outlets in the US now also once again sell Micro Machines. Early Micro Machines television commercials were famous for featuring actor John Moschitta, Jr., who is listed on the Guinness Book of World Records as the world’s fastest talker.